Track history was made during the 2019 premier event season kickoff to the 62nd year of racing at the iconic WeatherTech Raceway Laguna Seca road course. The Intercontinental GT Challenge California 8 Hours was the longest professional race in track history, both in duration – equaling the inaugural and second annual events – and in laps completed (327). The thrilling race was completed without a single Full Caution Yellow, allowing for eight hours of continuous action from the grid of international GT3 endurance racing teams. The diversity among automakers provided further intrigue with five different manufacturers being represented in the first five positions on the leaderboard: Ferrari, Mercedes-AMG, Porsche, Audi and BMW. No. 27 HubAuto Corsa drivers Nick Foster, Tim Slade and Miguel Molina had an outstanding performance in their Ferrari 488 GT3 to win the event and earn the second win by Ferrari in the Intercontinental GT Challenge Powered by Pirelli series. Molina, who resides in Spain, set the pace in qualifying and teamed with his Australian co-drivers to dominate most of the race. With the lead well in hand, Foster broke the tires loose going across Turn 11 before making the win official at the checkered stripe. The No. 999 Mercedes-AMG GruppeM Racing squad of Maxi Goetz, Maxi Buk and Raffaele Marciello charged hard to earn the second spot on the podium from the fifth row of the starting grid. Their effort padded Mercedes-AMG’s lead in the Manufacturer Standings. The last remaining podium spot belonged to the U.S.-based No. 911 Park Place Motorsports team. With the other Porsche GT3-R of incoming points leaders Matt Campbell, Dirk Werner and Dennis Olsen retired with gearbox issues, the German brand was represented with a valiant effort by the trio of Romain Dumas, Mathieu Jaminet and Sven Muller. No. 10 Audi Sport Team WRT, winners of the inaugural California 8 Hours in 2017, was the final team to finish on the lead lap. Dries Vanthoor took it home at the end for co-drivers Christopher Haase and Frederic Vervisch. Audi entered the event with an unblemished record following victories in 2017 (Team WRT) and 2018 (Team Land). Kelvin van der Linde, who was part of both previous winners, finished seventh with co-drivers Chris Mies and Markus Winkelhock in Team Land’s Audi R8 LMS GT3 Evo. No. 42 BMW Team Schnitzer made for five automakers in the first five positions with the efforts of drivers Martin Tomczyk, Chaz Mostert and Augusto Farfus. The No. 35 KCMG Nissan outfit set the quickest lap time early in the race and controlled the first hour until Ferrari gained the advantage on the first pit stop and orchestrated a mistake-free race for the remaining seven hours. They adapted conditions on the 11-turn, 2.238-mile circuit with surface temperatures that raised 26 degrees from the start of the race. No. 41 PF Racing captured the GT4 class win with a superb performance by Ford Mustang drivers Jade Buford, Jason Pesek and Chad McCumbee. Slavik outfit ARC Bratislava won GTC Cup with Lamborghini drivers Miroslav Konopka, Andrzej Lewandowski and Zdeno Mikulasko. Following the Sea Otter Classic cycling festival April 11-14, the premier racing event schedule at WeatherTech Raceway Laguna Seca continues on consecutive weekends with Trans Am SpeedFest May 3-5 and Ferrari Racing Days May 10-12. Tickets are available at advance pricing on www.WeatherTechRaceway.com or by calling 831-242-8200. Children 15 and under are admitted free with an accompanying adult. Derek Kraus came away with a third-place finish in the NAPA / ENEOS 150 at Irwindale Speedway on Saturday, to lead the way among four Bill McAnally Racing entries that all finished in the top 10 in NASCAR K&N Pro Series West competition before a sell-out crowd at the Southern California track. Following Kraus in the No. 16 NAPA AUTO PARTS Toyota Camry were his BMR teammates – with Hailie Deegan finishing fifth in the No. 19 Monster Energy/NAPA Power Premium Plus Toyota Camry, Brittney Zamora taking eighth in the No. 99 ENEOS / NAPA Filters Toyota Camry, and local driver Dylan Garner coming home ninth while making his series debut in BMR’s No. 50 Global Emission Systems / Kooks Headers Toyota Camry. Deegan led the way in qualifying earlier in the day, capturing her third career series pole award. Kraus was second quickest in time trials, giving BMR the front row for the third straight race at Irwindale. Garner qualified sixth, meanwhile, with Zamora 11th. Kraus jumped into the early lead and paced the field for the first 25 laps, with Deegan running close behind. While Garner settled into eighth, Zamora made a quick charge to fifth. Kraus appeared content to slip back a few spots in the first half of the race, but then charged from third to first on the restart following the midway break. Deegan spun a few laps later while battling for second and spent the second half of the race working her way back to the front. Kraus seemed headed for victory, but came up short with brake issues just seven laps from the finish. Despite the disappointment, Kraus remained upbeat about the event and leading the most laps. Kraus watched from third as Trevor Huddleston edged Tanner Gray in a thrilling side-by-side finish. BMR has 14 overall K&N Pro Series victories at Irwindale and was going for a sixth consecutive K&N West win at the half-mile track. With her top-five finish, Deegan retained her lead in the championship standings. The 17-year-old from Temecula, California is the first woman to lead the championship standings of a series at the regional or national level of NASCAR. Kraus is fourth in the standings; while Zamora – a 19-year-old series rookie from Kennewick, Washington – is eighth in points. Deegan and Kraus are both members of the NASCAR Next program that spotlights NASCAR’s emerging stars. Garner, 20, hails from Yorba Linda, California. Guests in attendance at Saturday’s race included NAPA store owners and shop owners, selected through a sales promotion with NAPA’s Los Angeles Distribution Center. Also on hand was a large group representing NAPA Power Premium Plus, and other manufacturers from NAPA. Guests from ENEOS were also in attendance at the event, which was the first NASCAR K&N Pro Series race in which ENEOS was involved as a sponsor. The Irwindale race will be televised to a national audience on NBCSN on April 8 at 5 p.m. PT. The next event on the K&N West schedule will be the Port of Tucson twin races at Arizona’s Tucson Speedway on May 11. Runner up one night ago, Colton Hardy found the missing pass and more as the Phoenix, Ariz. racer charged from eighth to win Saturday night with the San Tan Ford ASCS Desert Sprint Car Series. Adding to an already impressive weekend, which included a pair of wins in Micro competition, Hardy made the race-winning pass on the closing lap; edging out Joshua Shipley by 0.026 seconds to claim his first victory of the season with the San Tan Ford ASCS Desert Sprint Car Series. Shipley, who led from laps 15-24, ended with weekend with a pair of podium appearances. Friday night winner, Dennis Gile, crossed the line third with Kyle Shipley fourth and Matt Lundy fifth. Leading the opening 14 laps, Joe Scheopner slipped to sixth with Bruce St. James seventh. Tanner Grau, Rick Shuman, and Asa Kesterson completed the top-ten. The San Tan Ford ASCS Desert Sprint Car Series are in action again on Saturday, April 6 at Arizona Speedway in Queen Creek, Ariz.
For other news, notes, and information on the American Sprint Car Series, from the National Tour to any of the nine Regional Tours that make up ASCS Nation in 2019, log onto http://www.ascsracing.com, follow on Facebook, on Instagram, and on Twitter (@LucasOilASCS). Canyon Speedway Park - Peoria, Ariz.
Trevor Huddleston couldn’t have picked a more dramatic way to score his first NASCAR K&N Pro Series West win. Trevor Huddleston has been knocking on the door of his first career victory for some time, and he earned it, barely, at his home track of Irwindale Speedway in a photo finish over Tanner Gray in the ENEOS NAPA Auto 150. Huddleston battled a hit-or-miss transmission for the final 100 laps, forcing him to drive for most of the race with one hand on the steering wheel and one hand on the shifter. Huddleston and Gray banged doors off Turn 4 to the start/finish line and the Augora Hills, California native was able to inch his No. 9 Sunrise Ford ahead of Gray’s No. 15 DGR Crosley Toyota. After claiming the checkered flag, Huddleston hit the wall and was unable to drive his machine back to Victory Lane. Huddleston’s three Late Model track championships at Irwindale Speedway gave him a “one up on the field” leading into the 150-lapper. This event has been circled on his calendar for some time and to win his first race at the facility his father, Tim, operates made it that much sweeter. In only his second career series start, Gray almost put it in Victory Lane. Coming from a drag racing background, he knew immediately he didn’t beat the No. 9 to the line but did all he could leading up to that. Kraus came home third after leading a handful of laps, but he lost brakes with around 30 laps to go, allowing Huddleston and Gray to get by. Jagger Jones and polesitter Hailie Deegan rounded out the top five finishers. Cole Cabrera, Matt Levin, Brittney Zamora, Dylan Garner and Jack Wood completed the top 10. The ENEOS NAPA Auto 150 is scheduled to be broadcasted on NBCSN Wednesday, April 3 at 6 p.m. The next K&N Pro Series West will take place on Saturday, May 11 at Tucson Speedway. NASCAR Truck Series Champion Mike Skinner won the Vintage Race of Champions (VROC) Charity Pro-Am race benefitting national military nonprofit Hope For The Warriors. With a field of 14 cars where professional drivers are paired with amateur racers, the event was the first of three VROC races being hosted by Sportscar Vintage Racing Association (SVRA) with each benefitting a different charitable cause. Skinner will also compete in the VROC Series final two events being run at Indianapolis Motor Speedway in August and Virginia International Raceway in September. "What's cool about the VROC Series is getting to race against legends in our sport," said Skinner. "Al Unser Jr. has always been one of my heroes and we raced for the win today. From Davey Hamilton to Wally Dallenbach, Willy T. Ribbs, Dorsey Schroeder and Geoff Brabham--the list goes on and on. There were so many people that are icons. It's really cool to get in these old vintage cars--they're lumpy, they don't drive very good, so to get out there and wheel them around this historic course is something special. Today was a day that the fastest car didn't win; the most consistent car won and it was really great to be a part of that." Skinner paced the field in practice on Friday afternoon before qualifying third for the 50-minute timed race. Per series rules, Skinner's amateur teammate, Alan Sevadjian, took the green flag in the duo's 1967 Chevrolet Corvette owned by Sam Lecomte. With just three laps completed, Sevadjian pulled down pit road to turn the cockpit over to Skinner. The team timed their mandatory five-minute pit stop perfectly, and Skinner cycled back into the third position when all the driver changes were completed. As the race neared 30 minutes complete, Skinner moved into the second position and set a blistering pace catching the leader by approximately three seconds a lap. Trailing the leader by six tenths-of-a-second with just one lap to go, Skinner made a pass for the lead in turn 10A of the 12-turn course for his first VROC win. Military children pose with the drivers competing in the VROC Series during pre-race festivities at Road Atlanta. With Hope For The Warriors named as the event's beneficiary, the weekend also honored military children as the Month of the Military Child is quickly approaching in April. Timothy Colyer, the son of veteran Daniel Colyer, was paired with Skinner and Sevadjian to attend driver introductions and received a medal to recognize his service and sacrifice during the pre-race ceremony. "Having our veterans' children come hang out and get to enjoy this event with their parents was something really special," Skinner continued. "SVRA, Tony Parella [CEO of SVRA] and my wife, Angie [Skinner], put in a lot of hard work with Hope For The Warriors to make this an amazing event and help raise funds to assist military families. The kids that were here today probably don't even know who most of us are, but one day they might, and in the meantime, they were able to enjoy a great day with their families. "Racing is a great family sport. One of my favorite things about what we're doing today is that it gives me an opportunity to work with my sons. My youngest son, Dustin, was my crew chief this weekend, and while my oldest son, Jamie, was busy working at another track, he helps prepare all our cars before we leave the shop. Andrew Franzone--whose love of racing has made all of this possible--has helped us build a really strong race team where we're able to race at different tracks at the same time. We get to do everything from work with young racers to develop their talent to work on vintage cars and help make them faster. To watch my boys be successful in their careers makes me really proud as a dad; which I'm sure is a feeling that those military parents could relate to today as they watched their children have medals placed around their necks by racing champions." The competition for tomorrow’s Intercontinental GT Challenge California 8 Hours is at a fever pitch following a thrilling Pole Shootout at WeatherTech Raceway Laguna Seca. Eight automakers will be represented on the 20-car grid lead by the No. 30 Honda Team MOTUL Acura NSX GT3 which German racer Mario Farnbacher drove to the pole position. Farnbacher set a new qualifying lap record during the Pole Shootout with a time of 1:23.156, finishing two-tenths quicker than Alex Buncombe’s KCMG Nissan, while Dries Vanthoor finished third aboard Audi Sport Team WRT’s new R8 LMS GT3 Evo. As many different manufacturers also finished inside a top-six covered by less than 0.4s. It was the perfect start for Intercontinental GT Challenge Powered by Pirelli debutants, Honda, whose new NSX GT3 Evo is running as an Acura in its North American market this weekend. Its performance was equally remarkable given the car shared by Farnbacher, Bertrand Baguette and Renger van der Zande scraped through the day’s earlier qualifying session in 10th after missing the drop by just .005-second. Van der Zande is familiar with success at WeatherTech Raceway Laguna Seca with memorable victories earned in the IMSA WeatherTech SportsCar Championship. Audi has swept the previous California 8 Hours events in 2017 and 2018 with 22-year-old South African driving ace Kelvin van der Linde being part of both winning teams and setting the race lap record. The No. 29 Audi Sport Team Land squad of van der Linde, Christopher Mies and Markus Winkelhock look to rebound from its qualifying performance to make it three-in-a-row for van der Linde and a second win for his co-drivers. Mercedes AMG enters this event with the lead in the Manufacturer standings, though only one of four entries will start in the top 10 positions tomorrow. Driver Championship leaders Matt Campbell, Dennis Olsen and Dirk Werner will start in the third row in the Wright Place Motorsports Porsche 911 GT3 R.
Support series Pirelli GT4 America West concluded its activity with a Friday doubleheader. The No. 19 Cameron Racing BMW M4 GT4 driven by Sean Quinlan and Gregory Liefooghe won Race 1, and the No. 28 ST Racing BMW M4 GT4 won Race 2 with drivers Jon Miller and Harry Gottsacker standing tall atop the podium. The 60 drivers entered for tomorrow’s California 8 Hours represent 19 different countries. The West Coast’s only professional endurance race begins at 8:30 a.m. and lasts until 4:30 p.m. Spectator gates open at 6:30 a.m.
Tickets for today’s event are available at the gate for $35. Children 15 and under are free with an accompanying adult. The start and finish of the California 8 Hours will air live on CBS Sports Network at 8-11 a.m. and 3-5 p.m.
A long Winter paid off more than many can imagine on Friday night in Little Rock, Ark. as a wild series of passes over the course of the closing lap at I-30 Speedway saw Oklahoma's Harli White pick up her first career ASCS sanctioned victory in a multi-regional showdown between the ASCS Lone Star, Mid-South, and Sooner Regions. Going green from the fourth starting spot, in a car prepared by Johnny Herrera, the No. 17w rode in the show position for several laps before taking advantage of an early restart to grab second. Building momentum, the No. 17w raced past Joseph Miller on Lap 9 to take over the top spot. Brought to a stop for the flipped No. 26m of Fred Mattox a couple of laps after taking the lead, White wasted little time in building a comfortable buffer over the field, but as the No. 17w worked the backmarkers with less than five laps to go, a pair of ASCS veterans were stalking with Sam Hafertepe, Jr., from 13th, and seventh starting Wayne Johnson working to Harli's back bumper. Down to the final two circuits, Hafertepe rode the cushion with Johnson patiently around the hub of the Arkansas quarter-mile. With momentum on the top shelf, Hafertepe rolled off the fourth turn with a clear path to the lead as the white flag flew. Taking the No. 15h back to the top of turns one and two, however, Sam biked to the right-side tires, allowing Harli to retake the lead. Point straight off the second turn, Hafertepe railed the cushion of turns three and four, but the run was not enough as White let her Life of Hope Ministries No. 17w drift to the wall off the fourth turn to block the high side charge. While not able to clear for the lead, Hafertepe as able to retake the runner-up spot on the final lap with Wayne Johnson holding onto third. Gaining 11 spots, Howard Moore finished fourth with Dakota Gains in fifth. Charlie Louden advanced six spots with Seth Bergman crossing seventh. Canada's Dylan Westbrook was eighth with Ernie Ainsworth and Jordon Mallett making up the top-ten. With a field of 33 on hand, the showdown between the ASCS Lone Star, Mid-South, and Sooner Regions continues Saturday, March 30 with races getting underway at 7:00 P.M. (CT). Admission is $20 for the grandstands with kids 6-12 getting in for $1 with paid adult. Kids five and younger get in free. More information on "Hammer Hill" can be found at http://www.i-30speedway.com or by calling (501) 455-4567. I-30 Speedway - Little Rock, Ark. No driver has ever won three consecutive NASCAR Whelen Euro Series titles and that’s the milestone Alon Day and CAAL Racing are chasing in the 2019 European NASCAR season. The Israeli driver will be back behind the #54 CAAL Racing Chevy for his fifth NWES season. Arianna Casoli will aim at the Lady Trophy and the Legend Trophy in the ELITE 2 Division sharing the #54 with Day, while Mauro Trione will join the team in the ELITE 1 Division on the #31 car. Giovanni Trione will pilot the #31 Chevrolet SS in ELITE Club. With 17 career wins and back-to-back titles in 2017 and 2018, Alon Day can’t but be among the favourites in the battle for the 2019 NASCAR Whelen Euro Series title. The Israeli is ready to tackle the new challenges presented by a stronger-than-ever competition. “I am really excited to race again for the CAAL Racing team! After 4 years and 2 championships with them there is no better place for me, they became my family. This year is going to be challenging, we have new extremely good drivers like Jacques Villeneuve and many technical changes, new parts and new tires that are definitely going to be a game changer this year but with CAAL Racing we are ready to continue our hard work as we did in the past four years,” said Day. Alongside Day on the #54 Chevrolet, Arianna Casoli will compete in the ELITE 2 Division with the goal to not only win the Lady Trophy back after just missing it by just three points in 2018, but also to challenge for the Legend Trophy and for a place in the top-10 in the overall classification. Joining CAAL Racing for the first time will be Mauro Trione. The Swiss driver will enter his second season in NWES after battling for the Challenger Trophy until the very first race of the season in 2018 and is 100% focused on earning a place in the top-10 in the ELITE 1 Division. CAAL Racing will also enter the ELITE Club Division for the first time by fielding the #31 Chevrolet for Giovanni Trione, who made his absolute racing debut last year in Euro NASCAR’s regularity-based division and scored two podium finishes. Trione’s goal is to fight for the ELITE Club title and make his ELITE 2 Division debut before the end of the season. The NASCAR Whelen Euro Series season will begin on April 13-14 at the Circuit Ricardo Tormo in Valencia, Spain. Barrett-Jackson, The World’s Greatest Collector Car Auctions, will auction 30 vehicles from the World of Classics Collection at No Reserve during its 17th Annual Palm Beach Auction from April 11-13, 2019, at the South Florida Fairgrounds. Showcasing iconic examples of ’50s luxury and ’60s muscle, the collection features highly sought-after classic American marques, including a frame-off restored 1955 Cadillac Eldorado Convertible (Lot #660.2) and a 1960 Dodge Dart D500 Phoenix convertible (Lot #659). Leif-Ivan Karlsson is a Swedish entrepreneur who developed an affinity for American cars as a youth while working at a gas station. Over the years, Karlsson amassed a collection of American iron, which led him to open the first World of Classics Museum in Stockholm, Sweden. He later opened a second museum near his home in Florida – bringing a total of nearly 70,000 square feet of classic American cars on display to enthusiasts on both sides of the Atlantic. Capturing the ultimate status of 1950s luxury is a 1959 Cadillac Series 62 Convertible (Lot #660.1), which is equipped with a Continental kit and is finished in pink with a matching pink-on-white interior. Another head-turning Cadillac from the World of Classics Collection is a frame-off-restored blue-on-blue 1955 Cadillac Eldorado Convertible (Lot #660.2). One in a limited production of convertibles, this blue Cadillac is powered by dual 4-barrel Rochester carbureted 331ci V8 engine mated to an automatic transmission. Other featured ’50s head-turners in the collection include a 1958 Chrysler 300D (Lot #657.1) powered by a Firepower 392/380hp HEMI 8-cylinder Cross-Ram engine with dual 4-barrel carburetors, a 1953 Oldsmobile 98 Convertible (Lot #657.2) finished in Baby Blue over white and blue interior is powered by a 303ci V8 mated to an automatic transmission, and a 1955 Pontiac Star Chief convertible (Lot #657) powered by a 287ci 8-cylinder engine producing 180hp, coupled to a Hydramatic automatic transmission. 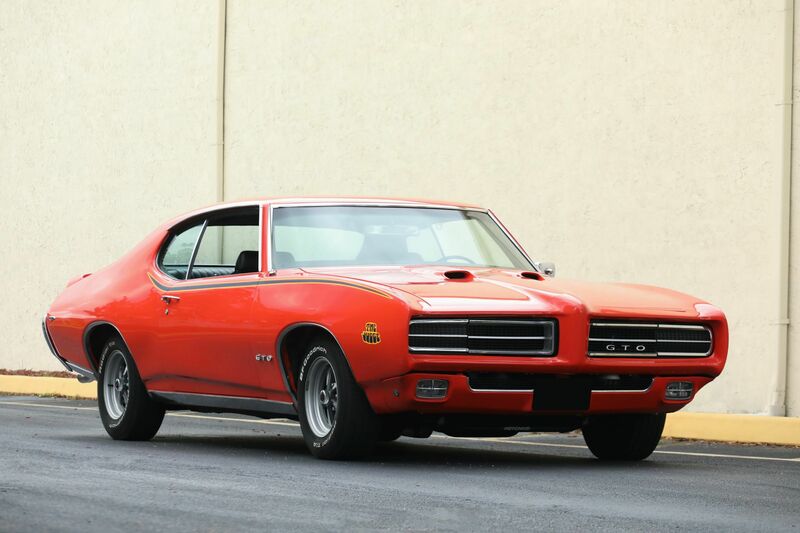 This 1969 Pontiac GTO Judge Ram Air (Lot #661.2) is powered by a 400ci 8-cylinder engine with 4-barrel carburetor backed by a 3-speed Turbo Hydramatic automatic transmission. Crossing the block with No Reserve on Saturday, April 13, 2019. Classic ’60s American muscle will also be featured, such as a frame-off restored 1962 Chevrolet Impala SS 409 convertible (Lot #659.1). Sporting an Ermine White exterior with a Roman Red interior, this pristine SS is powered by a 409ci V8 engine fed by dual 4-barrel carburetors. A 1969 Pontiac GTO Judge Ram Air (Lot #661.2) powered by a 400ci 8-cylinder engine with 4-barrel carburetor backed by a 3-speed Turbo Hydramatic automatic transmission. And a barn-find matching-numbers 1968 Chevrolet Corvette 427/400 convertible (Lot #658) features a 4-speed manual transmission and is powered by its original L68 427ci Tri-Power engine producing 400 horsepower. In total, the World of Classics Collection features 30 vehicles, all offered at No Reserve. A complete listing of the vehicles can be found here. Click here to view the complete 2019 Palm Beach Auction docket. For more information on becoming a bidder for the 2019 Palm Beach Auction, follow the link to www.Barrett-Jackson.com/bid. To submit an application to consign at the 2019 Palm Beach Auction, click here. Barrett-Jackson made history in Scottsdale this January by selling more cars at No Reserve than ever before, while identifying a number of key collector car market trends that the company will continue to fuel during the 17th Annual Palm Beach Auction, April 11-13, 2019, at the South Florida Fairgrounds. The growing demand for professionally built Resto-Mods along with new and classic imports ‒ trends that have long been predicted by Barrett-Jackson’s Craig Jackson and Steve Davis ‒ will make up an enviable part of this year’s Palm Beach Auction. Among those vehicles already consigned are a 2010 Ferrari 599 GTB Fiorano (#721) with just over 7,000 actual miles, as well as a 1964 Chevrolet Corvette Custom Coupe (Lot #734) and a fully restored matching-numbers 1967 Shelby GT500 (Lot #737). 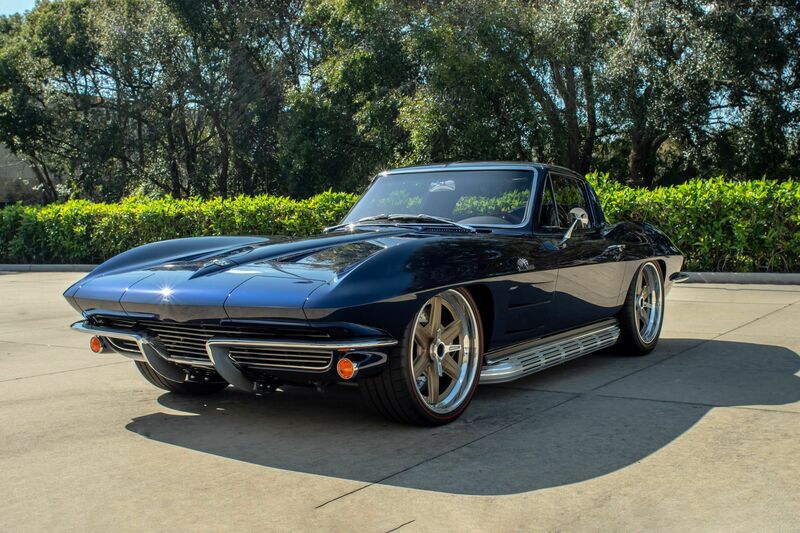 Equipped with a Roadster Shop narrowed Fast Track chassis and powered by a GM Performacne LT1 direct-injected engine, this 1964 Chevrolet Corvette Custom Coupe (Lot #734) produces 460hp and 465 ft/lbs of torque. 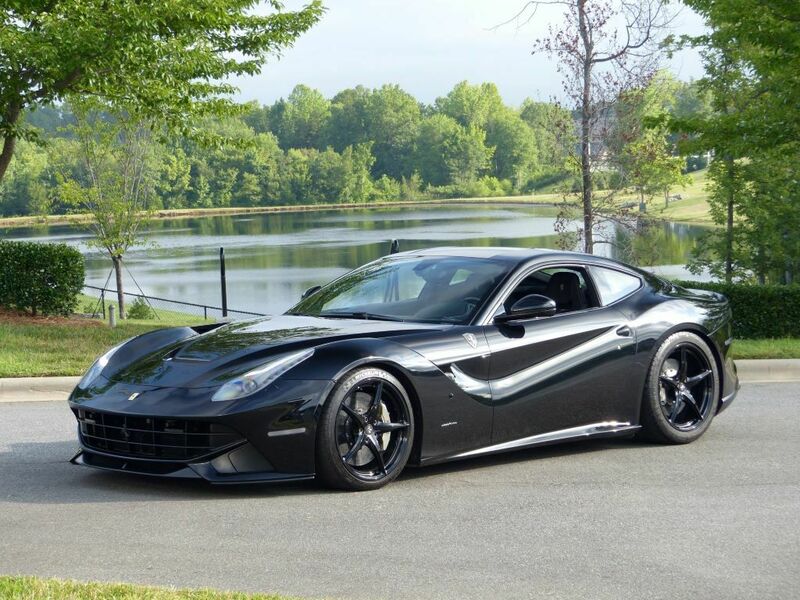 A Ferrari F12 Berlinetta is powered by a 729hp 6.3-liter V12 engine mated to a 7-speed F1 dual-clutch automatic transmission. Goes from 0 to 60 mph in 3.6 seconds. Some of the best examples of Resto-Mods that will be a part of the year’s Palm Beach Auction include a 1964 Chevrolet Corvette Custom Coupe (Lot #734). This professionally built Resto-Mod retains Corvette’s original design and brings the fit and finish to a standard never achieved during factory production. Also on the docket is a 1957 Chevrolet Bel Air Custom Hardtop (Lot #731), which won the Magnificent 7, First-in-Class and Outstanding Custom awards during the 2017 Houston Autorama. This Resto-Mod, with only 1,200 miles since its completion, was built over three years and is the result of thousands of labor hours and extensive parts. “Being at the forefront of the shifts in collector car buying – as they happen ‒ is an enviable place to be in,” said Steve Davis, president of Barrett-Jackson. “We’re fortunate to have the market knowledge, intel and data to build dockets that represent what buyers want. I believe our Palm Beach Auction will be a direct reflection of how we’re keeping the passion of this hobby alive. We’ll continue to stay in the driver’s seat by staying abreast of trends and consigning the types of cars that are in high demand. 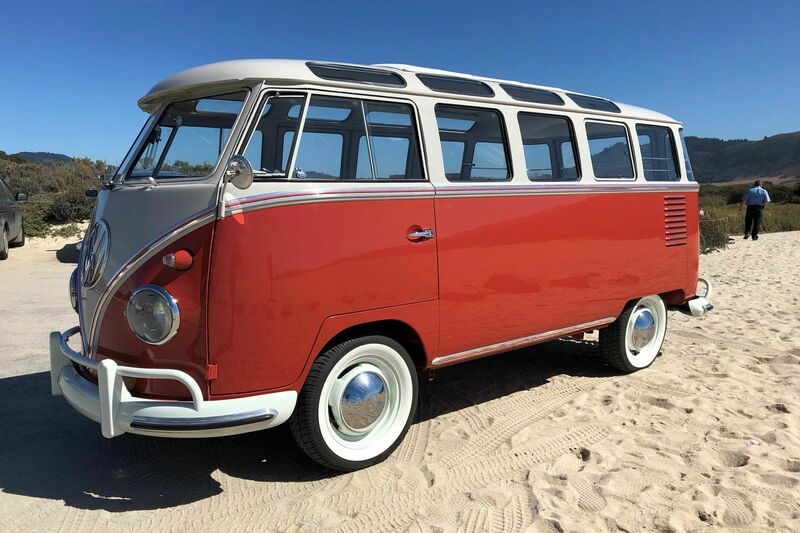 Designed by with Alpine sightseeing and mountain touring in mind, this 1959 Volkswagen 23-Window Microbus (Lot #729) has been fully restored and stands ready for that mission. A number of highly coveted modern and classic imports will be rolling in to Barrett-Jackson’s Palm Beach Auction. In the supercar category is a 2012 Lexus LFA (Lot #742), #444 of 500 built worldwide and capable of 0 to 60 mph in 3.5 seconds, as well as a 2014 Ferrari F12 Berlinetta with only 6,532 actual miles. This aluminum Pininfarina-bodied super car is capable of producing 729 horsepower with a V12 engine mated to a 7-speed F1 dual-clutch transmission. Also on the docket is a ground-up-restored 1965 Austin-Healey 3000 Mark III Convertible (Lot #705) complete with British Motor Industry Heritage Trust documentation, and a 1959 Volkswagen 23-Window Microbus (Lot #729) restored with all original parts. Click here for more information about the 2019 Palm Beach Auction. For more information on becoming a bidder for the 2019 Palm Beach Auction, follow the link to www.Barrett-Jackson.com/bid. To submit an application to consign at the 2019 Palm Beach Auction, click here.